Grey Goose Vodka are holding some innovative events around taste this summer. First up comes this immersive session with Dr Rachel Edwards-Stuart, with a series of experiments to make you understand more about how you taste. Plus vodka! 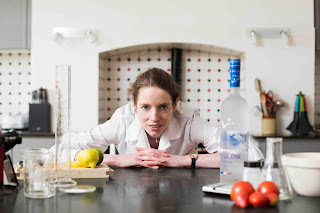 "Through a series of innovative taste experiments and Grey Goose cocktails, this immersive experience introduces the science behind flavour, accompanied by Grey Goose cocktails. Guests will have the opportunity to experience Rachel's work at first hand, as she seeks to explore a scientific approach to taste. You'll enjoy a Grey Goose Le Fizz and canapé reception as Rachel introduces the science behind flavour perception. She'll then invite you to take part in a series of tantalising experiments designed to demonstrate how our other senses affect the way we taste, and how genetics dictate many of our preferences. The two-hour masterclass takes place at Bread Street Kitchen, a breathtaking restaurant and bar in the shadow of St Paul's Cathedral."